We’ve talked a lot about food waste recently on My Zero Waste. According to our poll, 38% of you have a considerable amount of food waste going into your bin every week. According to WRAP’s Love food, hate waste campaign we throw away around a third of the food we buy every week in the UK. We’re running a competition to win a bokashi bin this month, courtesy of our lovely friends at Natural Collection. This will help turn your ‘waste’ into a valuable resource. Now there is the perfect compliment to reducing your food waste over on one of my favourite sites; Hippy Shopper. You can get your mitts on one of five copies of the wonderful book “The Green Food Bible” by Judith Wills by entering their competition. The Green Food bible has been born out of an increasing trend towards organic, healthy and responsibly produced food. This book will tell you all you need to know about food that’s ethical, organic, whole and healthy. It will walk you through the maze of conflicting advice we’re all getting from politicians, farmers, retailers, food manufacturers and the media so that you can make informed choices. In addition, The Green Food bible will help you eat seasonally, provide recipes and gives a hands-on guide to growing your own organic fruits and vegetables. Learning to eat in season means you can take advantage of farmers markets and farm shops. Most items are sold loose in these places which means you can buy exactly the amount you need and use your own packaging. If you are able to grow some of your own vegetables, there is no packaging and no waste to have to think about! For your chance to enter the competition and win one of these fabulous books from Hippy Shopper, visit their site. Hippy Shopper is your guide to ethical consumerism. With several blog posts each day, the information is up to date, current and delivered in an easy-to-read, light hearted style. So pop over to Hippy Shopper, enter the competition and sign up for their newsletter while you’re there! The site provides provides daily advice, product news and everything you need to make you go green. For more tips on how to reduce food waste, see our article. Reduce, reuse, recycle! A roundup of three top stories from the internet - from plastic bags to recipes! 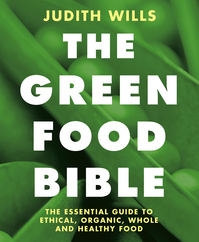 I first read about this book The Green Food Bible today and was extremely interested. I would love to win it. Hi Jean, Welcome to the site. It does look a wonderful book, but I doubt the competition is still open as it was advertised back in July. It would be worth contacting Abi at Hippy Shopper to see if she is still running it though – good luck!